In 2013, the global market for polypropylene was about 55 million tonnes. Polypropylene is the world's second-most widely produced synthetic plastic, after polyethylene. Polypropylene is in many aspects similar to polyethylene, especially in solution behaviour and electrical properties. The additionally present methyl group improves mechanical properties and thermal resistance, while the chemical resistance decreases. The properties of polypropylene depend on the molecular weight and molecular weight distribution, crystallinity, type and proportion of comonomer (if used) and the isotacticity. In isotactic polypropylene, for example, the CH3 groups are oriented on one side of the carbon backbone. This creates a greater degree of crystallinity and results in a stiffer material that is more resistant to creep than both atactic polypropylene and polyethylene. The Young's modulus of PP is between 1300 and 1800 N/mm². Polypropylene is at room temperature resistant to fats and almost all organic solvents, apart from strong oxidants. 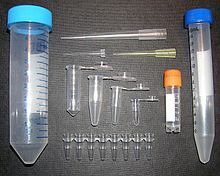 Non-oxidizing acids and bases can be stored in containers made of PP. At elevated temperature, PP can be dissolved in nonpolarity solvents such as xylene, tetralin and decalin. Due to the tertiary carbon atom PP is chemically less resistant than PE (see Markovnikov rule). Most commercial polypropylene is isotactic and has an intermediate level of crystallinity between that of low-density polyethylene (LDPE) and high-density polyethylene (HDPE). Isotactic & atactic polypropylene is soluble in P-xylene at 140 °C. Isotactic precipitates when the solution is cooled to 25 °C and atactic portion remains soluble in P-xylene. The melt flow rate (MFR) or melt flow index (MFI) is a measure of molecular weight of polypropylene. The measure helps to determine how easily the molten raw material will flow during processing. Polypropylene with higher MFR will fill the plastic mold more easily during the injection or blow-molding production process. As the melt flow increases, however, some physical properties, like impact strength, will decrease. 3 in the figure) relative to the methyl groups in neighboring monomer units has a strong effect on the polymer's ability to form crystals. Bulk slurry (or bulk): Uses liquid propylene instead of liquid inert hydrocarbon diluent. The polymer does not dissolve into a diluent, but rather rides on the liquid propylene. The formed polymer is withdrawn and any unreacted monomer is flashed off. Very thin sheets (~2–20 µm) of polypropylene are used as a dielectric within certain high-performance pulse and low-loss RFcapacitors. It can also be produced in sheet form, widely used for the production of stationery folders, packaging, and storage boxes. The wide color range, durability, low cost, and resistance to dirt make it ideal as a protective cover for papers and other materials. It is used in Rubik's Cube stickers because of these characteristics. In June 2016, a study showed that a mixture of polypropylene and durable superoleophobic surfaces created by two engineers from Ohio State University can repel liquids such as shampoo and oil. This technology could make it easier to remove all the liquid contents from a polypropylene bottles, particularly those that have high surface tension such as shampoo or oil. Polypropylene, or 'polypro', has been used for the fabrication of cold-weather base layers, such as long-sleeve shirts or long underwear. Polypropylene is also used in warm-weather clothing, in which it transports sweat away from the skin. More recently, polyester has replaced polypropylene in these applications in the U.S. military, such as in the ECWCS. Although polypropylene clothes are not easily flammable, they can melt, which may result in severe burns if the wearer is involved in an explosion or fire of any kind. Polypropylene undergarments are known for retaining body odors which are then difficult to remove. The current generation of polyester does not have this disadvantage. In the field of slope soaring, EPP has found greatest favour and use, as it permits the construction of radio-controlled model gliders of great strength and maneuverability. In consequence, the disciplines of slope combat (the active process of friendly competitors attempting to knock each other's planes out of the air by direct contact) and slope pylon racing have become commonplace, in direct consequence of the strength characteristics of the material EPP. Under the trade name Ulstron polypropylene rope is used to manufacture scoop nets for whitebait. It has also been used for sheets of yacht sails. PP can be melted using a speed welding technique. With speed welding, the plastic welder, similar to a soldering iron in appearance and wattage, is fitted with a feed tube for the plastic weld rod. The speed tip heats the rod and the substrate, while at the same time it presses the molten weld rod into position. A bead of softened plastic is laid into the joint, and the parts and weld rod fuse. With polypropylene, the melted welding rod must be "mixed" with the semi-melted base material being fabricated or repaired. A speed tip "gun" is essentially a soldering iron with a broad, flat tip that can be used to melt the weld joint and filler material to create a bond. In 2008, researchers in Canada asserted that quaternary ammonium biocides and oleamide were leaking out of certain polypropylene labware, affecting experimental results. As polypropylene is used in a wide number of food containers such as those for yogurt, Health Canada media spokesman Paul Duchesne said the department will be reviewing the findings to determine if steps are needed to protect consumers.